In January 2015, Acrolinx launched a research project to read and evaluate the world’s content. Using a proprietary linguistic analytics engine, our software reviewed 150,000 individual, public-facing web pages from 340 companies around the world. That represents 20 million sentences and over 160 million words. 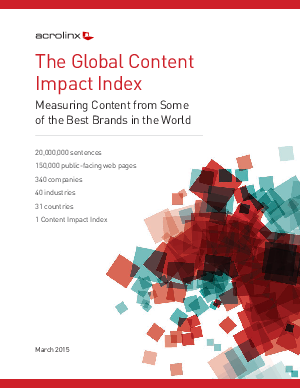 Read this white paper to read the findings of this research report and the effect of content.